I’ve been loath to write about what’s happening with Confederate statues, but a few sleepless nights cured my diffidence. As an architectural historian who works on memorials and has dabbled in the history of historic preservation, I’ve vacillated over the years between a Ruskinian position (“let it moulder”) and a Rieglian position, trying to establish some basis, however culturally relative, for how we value parts of the built environment. My first thought on the matter at hand is that there have been waves of iconoclasm since memorials and statues first became fixtures in the built environment. While the present phenomenon is part of a modern reaction to what are essentially political interventions in the built environment, Romans regularly cleared out the statues that cluttered the Forum. It was a form of political erasure, a fine art for any successful autocrat. France experienced moments of “statuophobia” tagged to the waves of revolutions that swept through that country in the 19th century. More recently, statues came down after the fall of the Soviet Union and its former puppet states, Saddam statues fell in Iraq, and across the world reactionaries have used iconoclasm as a form of violence manqué, often alongside actual violence. This sort of erasure has been a tool of the left and the right; iconoclasm is not a politically fixed act. But it is erasure and this is a point that we need to explore a bit more vigorously. What are these statues saying and should we be silencing it or responding to it? I’m not totally sure I know the answer to that question. 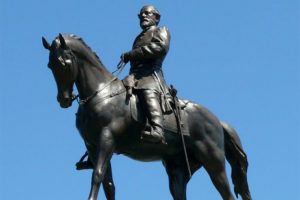 There is, luckily, a history of contest in the south over Civil War and civil rights statues, one explored in a recent book by Dell Upton: What Can and Can’t Be Said. The title gets right to the heart of it. We are witnessing a rupture in the basic conception of what can and can’t be said publicly. White nationalists, emboldened by the present regime, feel empowered to speak and are using monuments to do so. This is not a new use for these monuments, but the situation is amplified, acute, raw. These monuments are linguistically flexible. They can be quietly beautiful one moment, a seemingly harmless piece of civic adornment—and many were erected, we have forgotten, during the reign of the City Beautiful—and harnessed for evil in another. People have rushed in to counter the darkness unleashed in places like Charlottesville verbally, bodily, and violently. The violence has a larger context, of course, but some of it may issue from the fact that these statues are bold: tall, dignified, larger than life, often aesthetically powerful, and laden with layers of dark history. Going back to Upton’s title, what words can possibly counter that! Fists, lassoes, physical force of some sort seems to be the answer for many people. Where words fail to win the day, the statue comes down. But should it? It is, I suppose, not enough to argue that these statues are artistically significant. Beautiful things get destroyed routinely. We may rue their passing, but preservation often has a mightily precious view of artistic and age value. Perhaps there is some verbal or cultural equivalent to a martial arts move that could turn the power of these statues against them. Can they be lampooned, subtitled or otherwise diffused by further intervention? At the moment, I think not, at least not now. If Americans were capable of meaningful, civil dialogue, the white nationalists would not be marching and Antifa would not be storming the marches. But perhaps these statues have a role to play down the road, didactically, politically, aesthetically. I was astonished to learn that there has been for about 20 years a return to erecting Stalin statues in the former Soviet lands. Serious dialogue begins with empathy. Perhaps we might begin that dialogue with a considered act of empathy toward these statues. They are prisoners of war, in effect, and deserve that consideration.